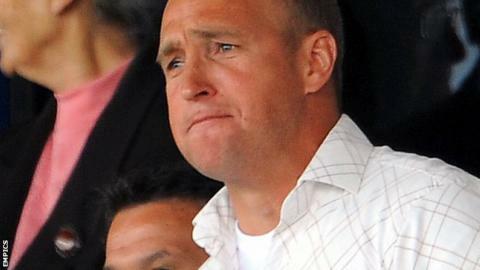 Hull FC come from behind to draw 22-22 at St Helens and leave new coach Nathan Brown still without a home win. Saints led 16-12 at the break thanks to first-half tries from Anthony Laffranchi, Francis Meli and Jordan Turner. Josh Jones' early second-half try earned them a 10-point lead for the second time. But tries from Tom Briscoe and Richard Whiting helped the Black and Whites turn it round. Jason Crookes and Shannon McDonnell grabbed Hull's first-half tries, Daniel Holdsworth kicking three of his side's conversions, matched by Lee Gaskell for Saints. Saints lost 40-4 at home to Brown's old club Huddersfield in his first home game in charge a fortnight ago, but bounced back last week with victory at neighbours Widnes. "They had enough ball to win three games in the second half but I'm disappointed because I thought we threw a point away. "I can't fault the guys' effort. We did improve from last week but the disappointing thing is that, every time we had them ready to break, we came up with silly errors or they got 50-50 calls - we couldn't buy one tonight. "We put the effort in to still get the two points but we didn't play smart enough. We need to improve again next week." "At this time of year it's a point gained. We had an opportunity to win it and the longer the game went the stronger belief that we could win it. "I was frustrated at half-time because we weren't playing as a team but in the second half the belief grew. "We're still misfiring but there is plenty of character there. The guys are excited and genuinely believe we are a good football team. We're a work in progress and we will get there eventually." St Helens: Wellens; Makinson, Turner, Jones, Meli; Gaskell, Lomax; Puletua, Roby, Laffranchi, Soliola, Wilkin, Manu, Flanagan. Replacements: McCarthy-Scarsbrook, Walmsley, Flanagan, Greenwood. Hull: McDonnell; Crookes, Crooks, Yeaman, Briscoe; Holdsworth, Horne; O'Meley, Houghton, Lynch, Galea, Green, Westerman. Replacements: Whiting, Pitts, Heremaia, Johnson.